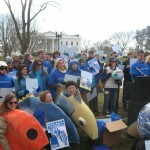 Capitol Hill Ocean Day was an opportunity for participants to meet and educate their congressional members on solutions for a healthier ocean. With a small group of people from each region, participants were given all the materials and guidance needed to participate in a day of successful meetings. This was the first step in turning all the information gained during the summit into action. The day started with a meeting on the Hill, followed by a series of scheduled meetings with members from districts, states and regions and concluded with a reception at the Mott House to celebrate everyone’s efforts and a great Summit weekend. Capitol Hill Ocean Day participants and Hill staff gathered together to talk about the importance of these meetings from both a constituent and staff perspective. Participants met with Members of Congress and the staff from their region. Participants celebrated and relaxed after a great Summit at the Mott House. Summit attendees, Congress members and staff, and DC leaders were all invited. Wine was provided by Barefoot Wine.